What is Your Bag Personality?! 60% of women own more than 10 handbags and 3% have at least 25, according to international statistics recently published! Are you one of them? Or do you have a different approach to handbags? 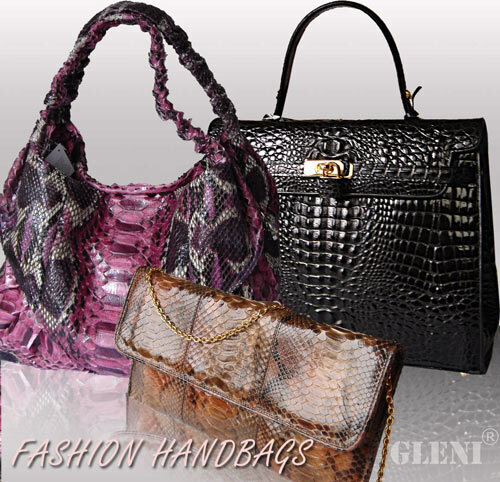 The Gleni staff has used our experience of the world of handbags to put together a light-hearted look at different philosophies of bag ownership. Try this fun quiz to see which bag personality sounds most like you, then turn to the results below to see if you and Gleni are a perfect match! You like a fairly classic bag, but it must be practical and big enough to fit all you need. You’re not too worried about what it is made of, as long as it is light to carry, easy to clean and above all can be used whatever the occasion. You don’t want the bother of switching between bags and like just to have one functional bag. You value the practicality and usability of your handbag more than its quality and look. You like a classic medium-sized handbag, which must be of good quality materials and well-made. You choose a bag with useful internal compartments, as you like everything to have its place in your bag, so you can be efficient and well organized. You don’t need a large bag, because you know how to make the best use of space and don’t carry around loads of unnecessary clutter. You like to change your bag about once a year and know exactly when the moment comes to look for a new one. You make your choice with care, considering this year’s hottest trends, and finding a good quality bag that suits your lifestyle. You usually have a favourite label and always choose a bag from that maker, checking out their new collections with great care. You stick to well known designer labels and are prepared to spend all your disposable income on your handbags. If you possibly can, you will collect all the models of handbag by your favourite designer. You don’t care so much about the bag’s color, style, materials or size. The important thing for you is to have the latest It bag. You usually just have one bag, but you like to look smart so it must have a prominent designer logo on show. You probably bought your bag quite a while ago, perhaps even in the sales, but you don’t care if it is a design from an old collection, or even if it is getting a bit worn, as long as the logo is still in good shape. You don’t want to spend an exorbitant amount on your handbag, so you will carry on using your old one until the next sales give you a chance to replace it with another bag, one with a logo well on display of course! You have lots and lots of bags and you like to pick a different one every day according to your look and your mood. You’ve got bags of every shape, size and color and you usually keep them all jumbled up in the closet or in the hall. Some of your bags are inexpensive, bought on impulse on a shopping trip, others are good quality ones, bought to go with a particular outfit. You are always buying bags: classic ones, fun ones, huge ones, casual bags, tiny purses or elegant evening bags. You choose a different one every morning to go with your clothes. You love collecting unusual bags in strange shapes and probably have a train, a bird, a house or a fruit shaped bag lurking in your closet, anything as long as it’s not a boring old normal bag! Even if you go out to buy an elegant bag you will probably come home with one that is covered in patterns, comic book characters or some other fanciful design. You’re a free spirit who doesn’t like to be weighed down, so you almost always go out without a handbag. You may even have a few good quality bags at home, but you’ve got into the habit of not using them, preferring to have your hands free, when you’re out and about. When you have to, you might take a small clutch or purse with you, containing just the bare minimum, but you’re so used to going out without a bag, that you’ll usually leave it behind somewhere, credit cards and all. You choose top quality, well-made bags, but are less interested in the designer label than the quality of the leather, the style and the functionality of the bag. You rarely buy on impulse, preferring to analyse your needs and wardrobe, planning exactly what bag will suit you best and make you feel secure throughout your day. You keep your bags in good condition, storing them away carefully when not in use. You usually buy a bag because you fall in love with it, the moment you set eyes on it and just have to have it. You don’t think about what it will go with, whether it is a practical size or what it will be used for. It’s love at first sight and you can’t live without that bag, even if it is just to keep it carefully in the closet and feast your eyes on it every time you open the door. Please remember that this is intended as a light-hearted quiz, put together from our personal experiences, and is not intended to criticise anyone who has different tastes in handbags or who doesn’t fit into any of the above categories! We’d love to hear from you if you have some observations to add to our list or if you think we have missed out an important Bag personality type. Let us know your personal point of view and what role handbags play in your life – we’d love to get to know you! Read on for the results of this quiz! Brilliant information and great site to visit. Informative and attractive layout….